Sea of Thieves is arguably Microsoft's hottest exclusive Xbox game in the last few years and now you can get it free when you buy an Xbox One X or even the older Xbox One S.
If you're in the US, you can also pick a second free game to add to your bundle from a choice of seven titles. Xbox One X bundles have been notoriously poor in the US in recent months with retailers barely offering any discounted software at all with the new 4K console. So getting a free game, especially a brand new exclusive in Sea of Thieves, is a great haul for new buyers. In the UK, Microsoft isn't just throwing in a free copy of Sea of Thieves, you're also getting Halo 5 as a further bonus. When you add the console to your basket, be sure to select the two games on the next screen to make sure they get added too. 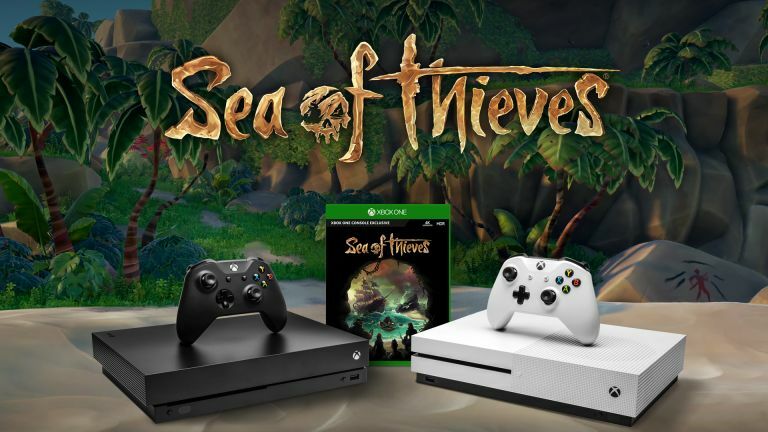 If you're not especially bothered about the 4K loveliness that the Xbox One X provides, then you can still get some great deals on the older Xbox One S bundled in with a copy of Sea of Thieves. In the UK you can get a 1TB Xbox One S with Sea of Thieves for just £249.99 at both Microsoft and Amazon. Update: Tesco has an even better UK deal at just £229. The same bundle in the US is going for $299.99 at Microsoft AND you get to choose an additional free game from a choice of seven, including Assassin's Creed: The Ezio Collection and Tom Clancy's The Division.